One of eastern North America's most common mushrooms, Lactarius glaucescens appears in July in oak-hickory forests, heralding the arrival of summer and (with enough rain) the large mycorrhizal mushrooms: boletes, amanitas, russulas, and other species of Lactarius. Distinguishing features for Lactarius glaucescens include its white colors, its densely crowded gills, its extremely acrid taste, and its milk, which turns slowly olive to pastel green on exposure. The gills are so crowded that, from a short distance, the underside of the cap can almost appear to be a solid surface (especially if your vision is as bad as mine). 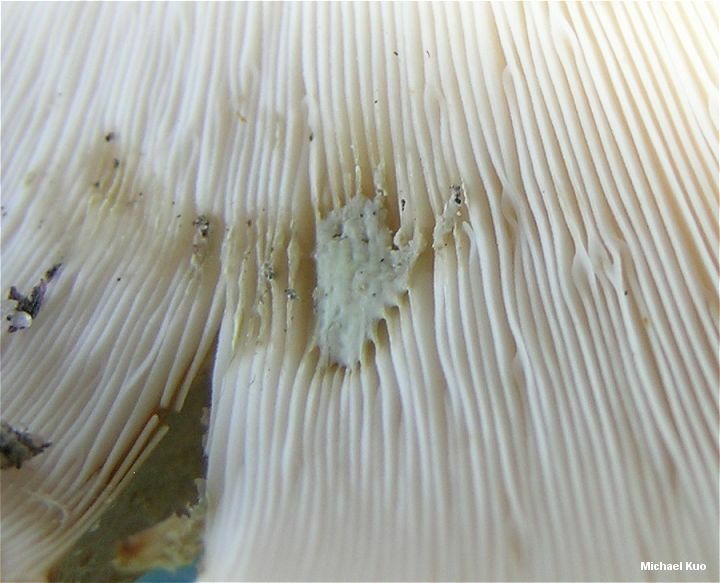 Other white, acrid species of Lactarius frequently found under eastern hardwoods include Lactarius piperatus (virtually identical to the naked eye, but with milk that does not turn green), Lactarius subvellereus var. 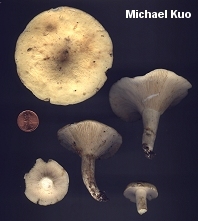 subdistans (cap velvety, gills nearly distant and spotting brownish), Lactarius deceptivus (cap margin at first inrolled and felty, surface becoming sub-scaly and brownish), and Lactarius maculatipes (milk turning yellow on exposure, stem with potholes). Lactarius piperatus var. glaucescens is a synonym. Ecology: Mycorrhizal with oaks and other hardwoods; growing scattered, gregariously, or sometimes in dense troops, often in moss; summer; widely distributed east of the Rocky Mountains. Cap: 4-11 cm; broadly convex, becoming flat, shallowly depressed, or vase-shaped; dry; the margin even; bald; soft; white or whitish, sometimes discoloring a little yellowish or brownish with age. 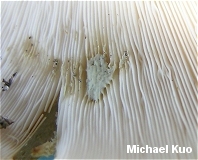 Gills: Beginning to run down the stem; very crowded; forking frequently; pale cream. 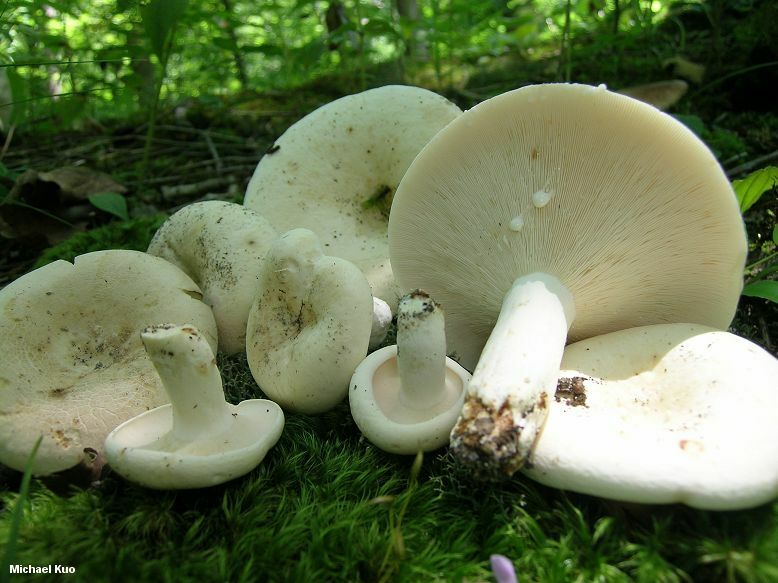 Stem: 3-10 cm long; 1-2 cm thick; white; tapering to base; bald; without potholes; solid. Flesh: White; thick; hard; unchanging when sliced. Milk: Copious; white; changing slowly (sometimes overnight) to olive green or pastel green; staining white paper yellow overnight. Odor and Taste: Odor fragrant, or not distinctive; taste excruciatingly acrid. Chemical Reactions: KOH negative to slowly pale orangish on cap surface. 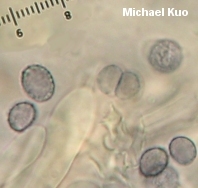 Microscopic Features: Spores 6-9 x 5-6.5 µ; broadly ellipsoid; ornamentation less than 0.5 µ high, as isolated warts and lines (ornamentation so low and inconspicuous that it is sometimes difficult to see, even with oil immersion). 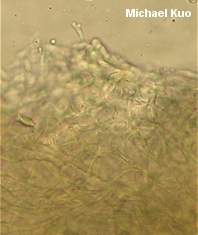 Pleuromacrocystidia absent, scattered, or abundant; when present subcylindric, up to about 90 µ long. Cheilocystidia subcylindric to subfusoid; up to about 60 x 10 µ. Pileipellis a hyphoepithelium with a fairly thick upper, cutis-like layer. REFERENCES: Crossland, 1900. (Saccardo, 1902; Hesler & Smith, 1979; Phillips, 1991/2005; Metzler & Metzler, 1992; Horn, Kay & Abel, 1993; Heilmann-Clausen et al., 1998; McNeil, 2006.) Herb. Kuo 08240202, 07150703, 07011002.